The Labrum (Figure 1a and Figure 1b) is a fibrocartilage structure which is attached along the edge of the acetabulum (socket) of the hip joint. It has a number of possible functions: the labrum acts as an extension to the joint deepening the socket making the hip more stable; it acts as a protective cushion between the edge of the acetabulum (socket) and the constantly moving femoral head (ball); it acts as a seal preventing the loss of joint fluid and maintaining the negative pressure within the hip joint both required for reducing friction and wear during motion and improving stability. Simple, isolated labral tears can be easily excised (Fig. 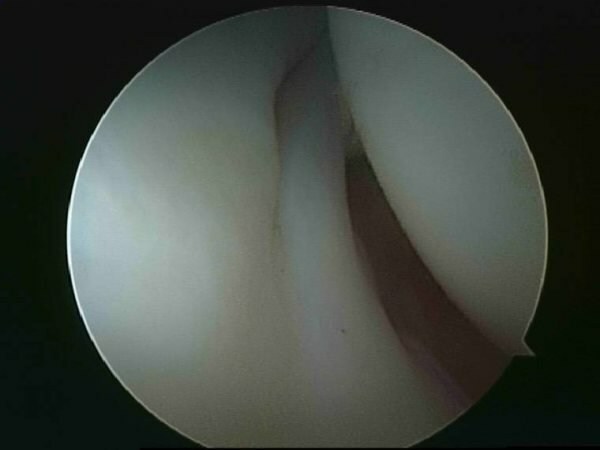 2c) or repaired; tears however are more commonly associated with a labral detachment and hip impingement which usually require more complex surgery. The Labrum becomes separated from its attachment to the edge of the acetabulum (socket); this can result from an injury or more commonly from Femoral Acetabular Impingement. A Labral detachment (Fig. 3a) will most often result in groin pain; activities and sports which require repetitive flexing and twisting of the hip, such as hurling, football, soccer, rugby, etc, may increase the intensity of the groin pain which may remain many hours after activities have ceased ; clicking and clunking of the hip also a common complaint. The detachment will almost always be associated with cartilage damage to the surface of the acetabulum (socket); initially this damage will be minor but with the edge of the cartilage surface now unprotected by the labrum further damage will continue to occur. 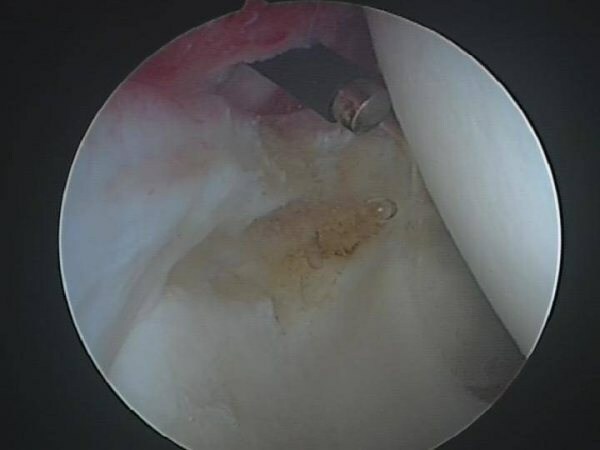 It is important that a labral detachment is diagnosed quickly and repaired to recreate a normal edge to the hip joint and stop further damage occurring. A patient with an isolated labral detachment once repaired can resume weight bearing immediately and would expect a rapid return to sports. More commonly, a labral detachment is associated with Femoral Acetabular Impingement and will require more extensive surgery to remove the impingement. Hip Impingement (Figures 4a and b, 5a and b) is characterised by the development of groin discomfort usually during or after exercise; the groin discomfort often increases slowly with time and is usually associated with increasing stiffness of the hip, inflexibility and tightness of thigh, commonly persisting for hours and often days after exertion; hip impingement should always be excluded clinically, if athletes present with chronic groin pain, adductor (inside of thigh) pain or recurrent groin/adductor injuries. Impingement of the hip results from prolonged and repetitive abnormal contact between the femoral head (ball) and acetabulum (socket) of the hip joint. It can occur early in teenage athletes but is much more common in athletes in their twenties and early thirties. Continued impingement (6a and b) is likely to lead to progressive damage to the hip joint; labral tears or detachments are common in the early stages of impingement with cartilage and bony damage developing later. It is now generally accepted by many hip surgeons that hip impingement is the most common cause of arthritis in younger adults, which may require a hip replacement. Initially, mild groin discomfort may present following intense activity, the discomfort at this stage occurs following exertion and may last for a number of hours; rest from strenuous activity and physiotherapy will often relieve symptoms and allow a return to sport. The discomfort however will usually return and will often increase in severity with time, limiting sports and at this stage the discomfort may last for a number of days; groin pain or ache is commonly associated with side to side and twisting movements during training or playing; the groin and inner thigh will often feel tight and inflexible. As the impingement slowly increases the pain will often stop training and playing; running in straight lines usually can be managed without much discomfort. At this stage periods of rest and physiotherapy make little improvement to symptoms and return to sports remains difficult. Chronic groin pain, adductor strain, slowing of speed, pain on push off when beginning to run, are often associated with increasing impingement. The impingement affects the ability to flex the hip making it more difficult to put on shoes and socks, having to sit down to dry the foot following a shower; discomfort makes prolonged sitting or driving a car more uncomfortable. Young sportsmen and women who develop symptoms similar to those listed above should have their hip examined and investigated by an expert in this area, who can then offer the appropriate reassurance and advice. 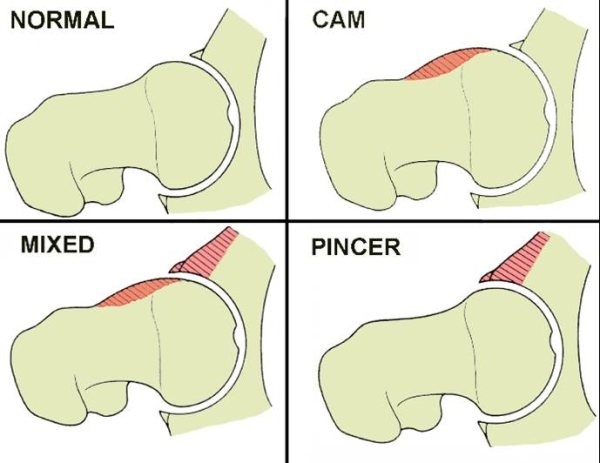 There are two commonly recognised processes which may lead to hip impingement – the development of a CAM or a Pincer deformity of the hip joint. A CAM deformity ( Fig 8 ) results from the development of a bony prominence (bump) on the anterior surface (front) of the femoral head (ball); with repetitive flexion of the hip i.e. striking a ball, jumping, squatting, etc.. The CAM lesion (bump) rubs against the underside of the edge of the acetabulum (socket) resulting in abrasive damage to the labrum (seal of the hip). The loss of the integrity of the labrum is the first step in progressive damage to the hip joint. 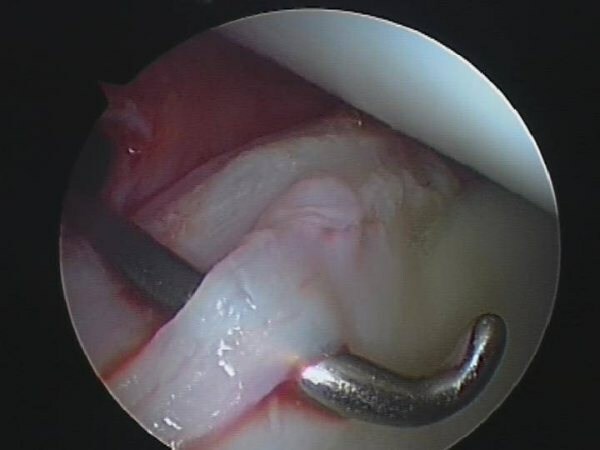 Watch the video on CAM impingement and Read about removing the CAM deformity. Progressive extension of the bony edge of the acetabulum (socket) acts as a mechanical block to hip flexion with eburnation (rubbing) of the femoral head resulting in reactive changes which lead to a CAM deformity developing; the pincer deformity forces the labrum against the femoral head resulting again in abrasive damage leading to a labral tear or detachment. The shape of the acetabulum (socket) may predispose patients to developing a Pincer deformity such as an abnormally deep socket or a socket with poor orientation. Watch the video on Pincer impingement and Read about the removing Pincer deformity procedure. The hip movements are notably reduced with impingement; hip flexion, internal rotation and adduction are the first movements to become restricted and painful when compared to the other side. Impingement can often occur in both hips simultaneously and the examination in this case will demonstrate similar pain and restriction of both hips. With maximal flexion and adduction if the hip is internally rotated groin pain will result. Often restricted straight leg raising due to hamstring tightness occurs in patients with chronic hip impingement; adductor muscle tightness and discomfort is also common. Chronic impingement can also be associated with recurrent groin strain; coughing and sneezing may increase pain. Tenderness over the pubic bone and at the external inguinal ring (the opening of the groin) is often present. Weakness of the groin soft tissues (transversalis fascia) and disruption of the conjoint tendon are often responsible. These symptoms and signs are better known as Gilmore’s groin or sportsman’s hernia. X-rays of the pelvis and hip joints are essential for all patients suspected of having hip impingement; the presence of a CAM or Pincer deformity can easily be noted, if present; the shape and orientation of the socket can be measured. An anteroposterior (AP) view of the pelvis (Fig. 4a) and a true lateral view (Fig. 4b) of the affected hip provide are required. These x-rays may be taken at any hospital but it is advised that all investigations as far as possible should take place at the Whitfield Clinic to ensure correct views are obtained or x-rays may need to be repeated. 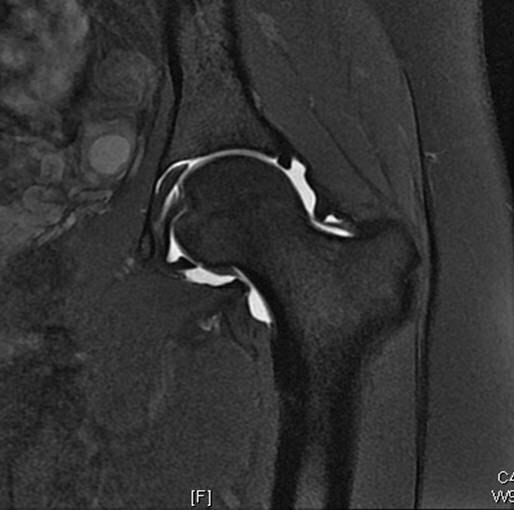 This is an MRI of the hip following the injection of contrast fluid into the hip joint MRI without contrast is not as good at defining possible injuries to the cartilage and labrum in the hip joint. The MR Arthrogram will take place in the Whitfield Clinic MRI Department; special sequences are prepared to maximise the accuracy of the scans for interpretation. 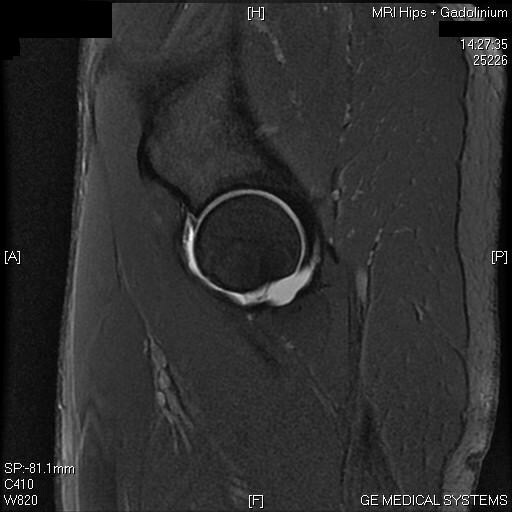 All patients with a diagnosis of impingement or those with a possible labral tear/detachment will require an MR Arthrogram (Fig 9a). Arthroscopic (keyhole) surgery of the hip is required to treat labral tear/detachments as well as femoral acetabular impingement. Read about the treatment for Hip Impingement. OA is a progressive, degenerative condition which results in gradual damage to the joint cartilage of the hip resulting in loss of the joint space and abnormal bone repair which leads to increasing stiffness, loss of function and pain (Fig. 11a). Although the cause of OA of the hip is still unknown many factors can increase the risk; genetic factors such as abnormal hip development (congenital dislocation of the hip, Perthes’ disease, Slipped Capital Femoral Epiphysis), metabolic bone disease, inflammatory joint conditions may all precipitate early arthritis; environmental factors such as lifestyle (intense sport related activities such as hurling, football, soccer, rugby, running, etc), occupation (heavy lifting, climbing ladders, etc) and obesity, can increase the likelihood for the development of OA. 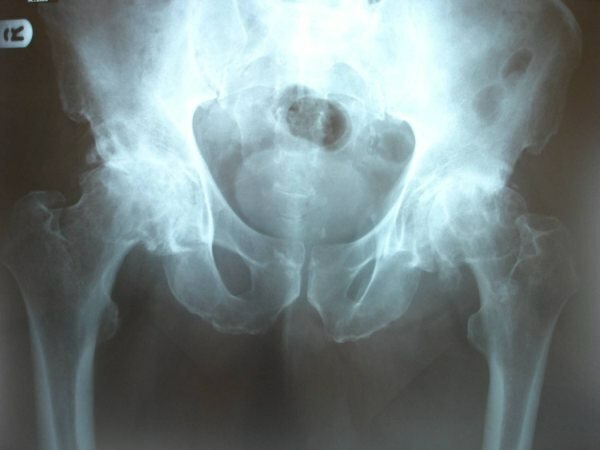 Up to three-quarters of males and almost half of all females with osteoarthritis of the hip are thought to have had pre-existing Femoral Acetabular Impingement (FAI), a condition characterised by chronic and recurrent abnormal contact between the femoral head (ball) and the acetabulum (socket), resulting in damage to the protective edge of the socket (Labrum), which exposes the joint cartilage to progressive damage. Stiffness and loss of function : Patients will generally develop gradual symptoms over many years including progressive stiffness of the hip characterised by difficulty getting in and out of a car or bath, difficulty putting on shoes and socks, cutting or painting toenails; the stiffness then makes walking up and downstairs or hills uncomfortable. Pain : Pain initially begins with prolonged activities but gradually presents with walking, eventually the pain is present all of the time causing difficulty sleeping at night and requiring increasing anti-inflammatory and pain relief medication. The pain is classically groin ache but may also present with pain running down the front or the side of the thigh, at the back of the hip and can be associated with lower back discomfort. Limping : As the pain and stiffness progress limping will increase as the hip becomes uncomfortable to put weight through, profound muscle weakness follows, eventually hip deformity results. Conservative measures : The main aim of conservative management of hip osteoarthritis is to maintain function, flexibility and pain relief; non-impact activities such as swimming or cycling may be beneficial in maintaining function; stretching and strengthening of the pelvic and leg muscles will help maintain flexibility; a variety of medications are available to help control the symptoms of hip OA and should be prescribed under the guidance of your general practitioner. 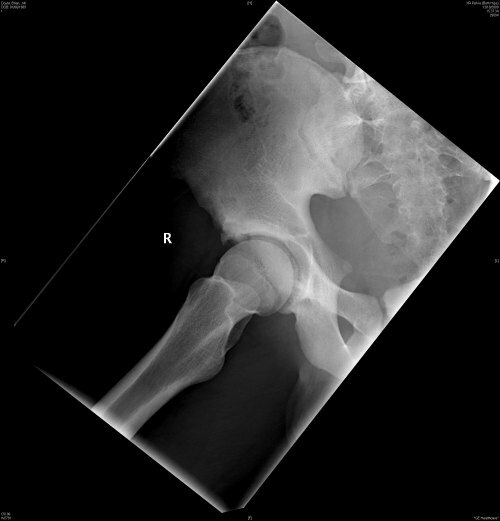 Definitive Surgical Treatment : Although many procedures exist to help in controlling the symptoms from hip osteoarthritis such as intra articular injection of cortisone or arthroscopic debridement, once significant osteoarthritis is demonstrated both on examination and x-ray investigation, and following failure of conservative measures to control pain, then a hip replacement is generally advised. There are many variations of hip replacements available and appropriate selection would often depend on age, fitness, and lifestyle and on patient requirements. Total Hip Replacement. This condition is characterised by an audible and often painful click or clunk during particular movements of the lower limb. It consists mainly of three main categories – internal, external and intra-articular causes. The most common type is external snapping which has a higher incidence in females mainly in their teens and early twenties. It is caused by a tightness of the Iliotibial band along the lateral thigh and it ’snaps’ forwards and back across the bony prominence of the greater trochanter with movement. The tightness of the Iliotibial band is believed to result from repetitive minor injury to the under surface of the muscle which becomes progressively thickened, increasing the symptoms. Patients often become habitual ’snappers’ feeling that snapping the hip relieves the tightness and pressure around the thigh. Internal snapping results mainly from the Iliopsoas tendon snapping over the femoral head or Iliopectineal eminence; intra-articular snapping can result from a number of pathologies within the hip joint such as loose bodies, labral tear or detachment. The diagnosis is usually easily made after careful history and thorough clinical examination. With external snapping, there is often associated bursitis at the trochanter which may be locally tender, snapping can usually be palpated with the patient recreating the movement responsible i.e. flexing the hip from an adducted position. Ober’s test may indicate a tight Iliotibial band – with the knee fully flexed and the hip, extended and abducted, adduct the leg fully – if the leg can be adducted to or beyond the midline then Ober’s test is negative. Internal snapping results from generally bringing the hip from a fully flexed position into extension. Intra – articular snapping should be considered after ruling out the other varieties and if groin pain is present; flexing, adduction and internal rotation may reproduce snapping and increase pain. 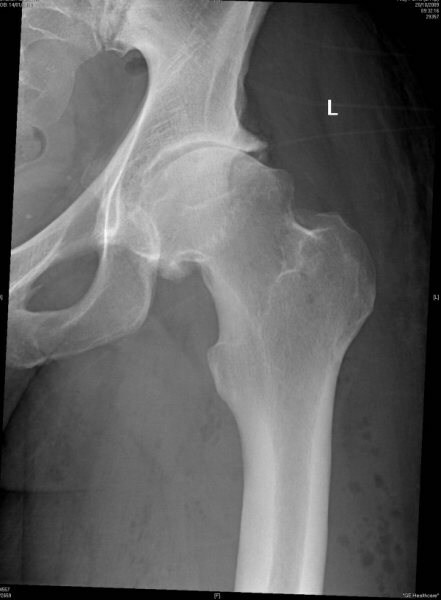 Imaging is not usually required to diagnose snapping hip syndrome but is helpful in confirming the diagnosis; x-rays are useful in determining the anatomy of the pelvis and hips; ultrasound may help observe snapping but is very user dependent, MRI and MR arthogram are excellent in determining intra-articular causes. Conservative measures are often employed initially to stretch and strengthen the muscles and tendons involved; surgery is undertaken most commonly for external and intra-articular causes. 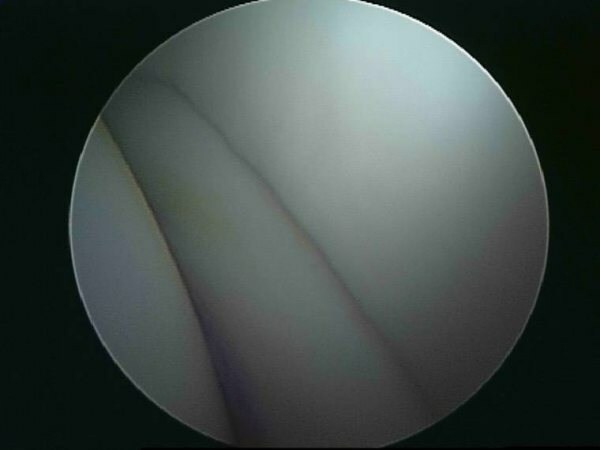 Release of the Iliotibial band is used to relieve the symptoms from external snapping and hip arthroscopy is usually required for internal derangement of the hip (see procedures). Read about Fascia Lata Release. 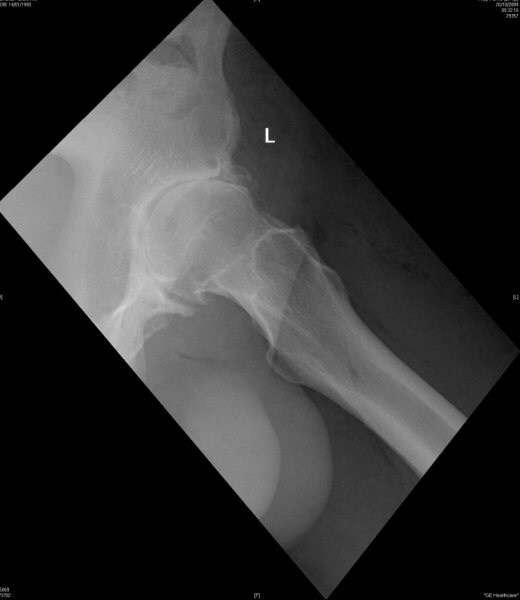 Stress fractures occur in the femur and the pelvis as a result of progressively weakened bone architecture due to repetitive often high intensity strain; this results in increased resorption of bone with remodelling unable to keep pace leading to multiple and recurrent microfractures and increasing pain. Pain usually increases with activity and is relieved by rest. Patients with low bone density have a higher rate of stress fracture. The most common regions around the pelvis and hip for stress fractures to occur are the pubic rami, sacrum and femoral neck. Pelvic stress fractures are normally treated conservatively with rest, activity avoidance with the slow re-introduction of weight bearing activity as healing progresses. Femoral neck stress fractures are of two types – compression side and tension side; they are either undisplaced or displaced. X-rays may demonstrate the stress fracture but in many cases may appear normal in the earlier stages following the injury; an isotope bone scan or MRI are excellent investigations which will very clearly demonstrate increased uptake and high signal, respectively, indicating oedema and inflammation in keeping with a stress related bony injury. 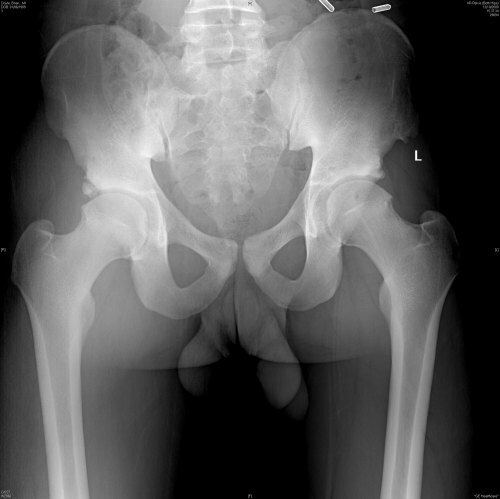 Undisplaced, compression type stress fractures may be treated conservatively; displaced or tension side stress fractures need internal fixation with compression hip screws to promote union and limit the possibility of avascular necrosis (bone death). Groin disruption is a progressive weakness of the posterior wall (Transversalis Fascia) of the groin (Inguinal canal) often associated with a rupture of the attachment of the Conjoined tendon to the Pubic Tubercle and breakdown of the fascial anterior wall of the inguinal canal with dilatation of the external inguinal ring. The condition is also known as Gilmore’s groin or a sportsman’s hernia (although no hernia actually exists!). It was first described in 1980 following explorative surgery on three professional footballers with career ending groin pain; following repair of the defect, the footballers returned to sports. Recurrent stretching and strain placed across the groin over time repetitively is thought to be the main cause although it is often associated with muscle weakness and imbalance of muscles working around the groin region; it can also present following an acute injury. Athletes may develop groin related pain either acutely following an injury but more commonly the symptoms increase over a period of time during strenuous activity; pain associated with straining, coughing or sneezing is uncommon. Sprinting, twisting and turning, squats, sit-ups and high intensity activity may increase the pain which is often relieved initially with rest. As the condition deteriorates simple activities become painful. The pain is often present in the upper, inside region of the thigh, deep in the front of the groin or centrally along the bottom of the lower abdominal wall. The diagnosis is based on clinical examination with investigations generally more useful in ruling out other pathology. Discomfort can often be reproduced with palpation of the external inguinal ring (the opening of the groin) which may feel weaker and dilated compared with the non-painful side; resisted adduction of the limb (bringing one leg toward the other) in flexion and extension may result in discomfort in the groin; discomfort may be present on palpating along the lower border of rectus abdominus and at its insertion into the pubic bone. The clinical examination and investigations are very important in ruling out any underlying conditions affecting the adductor group of muscles or femoral acetabular impingement of the hips, both of which may also coexist with groin disruption. Conservative management is generally employed for the first six weeks in an attempt to rest, stretch and strengthen the muscles in and around the groin; with failure of conservative management then surgical exploration in undertaken, with a groin repair, if required. Surgery is performed as a daycase or overnight stay and a personal rehabilitation programme is provided to guide recovery and maximise the success of treatment. A return to competitive sport is usually expected around 6 weeks from operation. Read about Rehabilitation for Groin Disruption. Read about the Surgery for Groin Disruption. One of the most common causes of groin strain is an injury to the adductor muscles and tendons. This powerful group of muscles plays an integral role in the majority of weight bearing activities and sports; and is placed under intense strain during many actions required in sports involving kicking, rapid changes in speed and direction, twisting and turning such as soccer, GAA football, hurling, rugby, athletics, running, etc. Most adductor injuries result from repetitive minor strains with recurrent episodes of pain and eventual breakdown associated with chronic pain, tightness and weakness preventing a return to sport and activity; adductor injury may also occur as a single acute event with no previous history of pain and may represent a partial or full rupture of the adductor tendon from its origin on the pubic bone. These adductor strains are easily diagnosed by taking an accurate history and performing a thorough examination. Other groin conditions with similar symptoms need to be excluded such as Osteitis Pubis and sports hernia. Diagnosis can be made by palpating the adductor muscle tendons from their origin at the pubis to the musculotendinous junction in the upper thigh and testing for pain on resistance of adduction in both flexion and extension; these signs are often associated with weakness of the muscle group and asymmetrical restriction of abduction of the hip compared to the uninjured side. Chronic adductor pain is often bilateral and is characteristically present in patients with underlying hip stiffness (e.g. Femoroacetabular impingement); often concomitant stiffness of the hamstrings is also present. Investigation may be required in the acute setting to ensure a partial or full thickness tear has not occurred; such injuries may be observed with Ultrasound imaging but are best visualised with MRI scanning. Contrast enhancement may be useful and special sequences are employed to maximise visualisation of the adductors at their origin. Management of the majority of chronic adductor strains remains conservative initially; any acute injury is managed with rest, ice, elevation, compression and anti-inflammatory medicine. An active rehabilitation programme is then employed to maintain flexibility and improve strength; successful treatment may take 8 – 12 weeks and in some chronic cases much longer. Corticosteroid injections (see pubic cleft injection) may be useful as an adjunct to an active rehabilitation programme in selected cases. Surgical management is usually required for acute tendon ruptures and chronic refractory cases often with good success. Surgery is performed as a daycase procedure or short overnight stay and involves a minor procedure to de-tension the adductor group of muscles while maintaining their integrity and strength; the procedure performed at the Hip and Groin Clinic is not an Adductor tenotomy. For full thickness and some partial thickness tendon ruptures surgical repair using suture anchors for robust fixation is undertaken. A personal rehabilitation programme will be provided for each patient post operation. Read about the Adductor Injury procedures. This condition is often a self limiting pain felt centrally in the pubic symphysis; it is common in long distance runners; a deep aching pain which increases in severity with increasing intensity and duration of exercise. 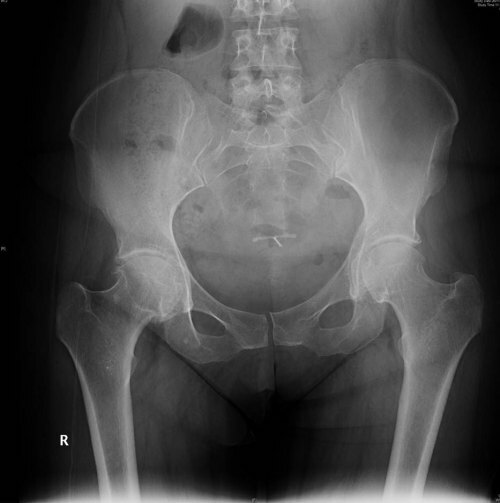 It can often present similar symptoms to chronic adductor strain and hip related pathology, especially if bilateral; Osteitis pubis may in many cases be over-diagnosed and radiological features associated with this condition may be present simply as a consequence of other pathology. Repetitive stress from shearing forces at the symphysis pubis along with chronic traction injury from the pelvic muscles acting around the pubis are considered to be the two main processes which result in inflammation at the symphysis. Diagnosis is made initially on clinical history and examination; tenderness can often be elicited on palpation along the symphysis pubis and on stressing the symphysis with pelvic compression and shearing tests. In the absence of hip, groin or adductor pathology a diagnosis of Osteitis pubis may be appropriate. 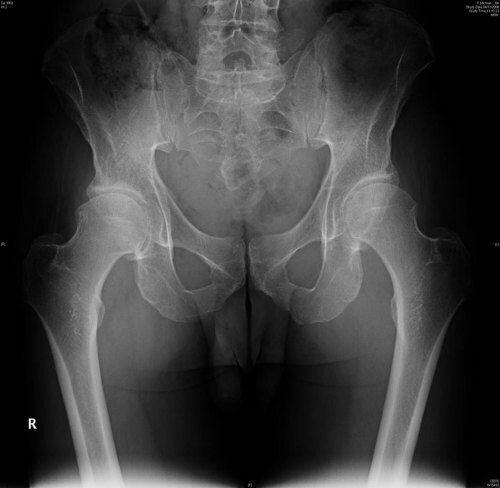 Investigations can be useful in helping with a diagnosis; x-rays may demonstrate low bone density, widening, fragmentation and sclerosis of the symphysis, isotope bone-scans may demonstrate increased uptake in the symphysis indicated underlying inflammation; MRI scanning is most frequently used which may demonstrate high signal, representing oedema, around the pubis. Treatment remains largely conservative often requiring a protracted rehabilitation programme, rest, non steroidal anti-inflammatory (NSAID) medication and avoidance of activities increasing the pain; corticosteroid injections may have a role in selected patients; surgery, such as pubic symphysis curettage/fusion, is not common place. The trochanteric bursa is a fluid-filled sac that functions as a gliding surface to reduce friction between the bony prominence on the outside of the thigh bone (greater trochanter) and the muscles that lie over this bone. Trochanteric bursitis is characterised by aching pain over the outer aspect of the hip with tenderness at the point of the hip. It is a common cause of hip pain due to inflammation of the trochanteric bursa.The pain may be worse at night, when lying on the affected hip, or when getting up from a chair.The hip joint itself is not involved and is more common in women and with increasing age. Overuse: Athletes who participate in sports which involve running or prolonged pressure may cause repetitive irritation of the bursa. Trauma: A fall onto the outer / upper thigh or bumping your hip on the edge of a table may cause inflammation of the bursa. Overweight: Excess weight increases stress on the bursa. Inflammatory conditions: Such as polymyalgia rheumatica, rheumatoid arthritis. Surgery: Hip surgery may cause some irritation of the bursa. Bone spurs: Hip bone spurs or calcium deposits in the tendons which attach to the trochanter may irritate the trochanteric bursa. An X-Ray will rule out bone spurs or areas of calcification which could be contributing to your problem. The treatment for the vast majority of patients is conservative with the main focus being placed on muscle strengthening and rehabilitation; cortisone injections can be useful for resistant cases and surgery is rarely needed. Please view the information leaflet and home exercise programme [pdf].